Regulars of the erupting underground UK music scene, D-BLOCK EUROPE have consistently elevated their success and awareness with each of their independent releases, leaving them at the top of the pile and on the brink of a major breakthrough for their music. Capturing attention of millions of YouTube viewers on a regular basis via their impeccable music and visuals, their latest release ‘The Shard’ is quickly becoming their biggest to date, having already notched up a majorly impressive 4.5 million views, yet surprisingly, until this point it has been unavailable on streaming sites. 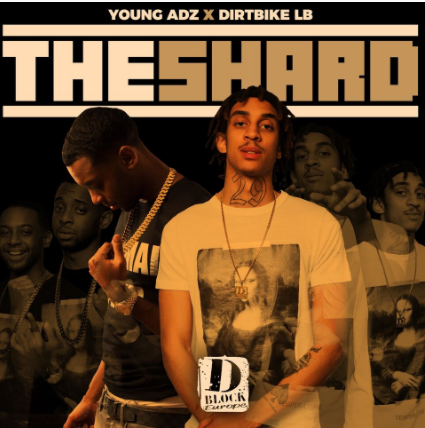 As one of the most sought after, upcoming acts in the UK Rap and music world, Young Adz and Dirtbike LB caught the attention of U.S Rap purveyors D-Block (Jadakiss, Styles P, Sheek Louch) back in 2014 and with their cosigning, brought life to D-Block Europe. Persistent with their music output ever since, they have now been taken under the wing of Ministry of Sound Recordings for their first official release, which will see ‘The Shard’ become available across digital streaming sites for the first time, despite its already huge success on YouTube. The move pinpoints the turning point of D-Block Europe’s reign as they have a string of new material set to drop, which will include exclusive new singles and a new mixtape. Artistically their melodic delivery teams with an array of gritty social commentary and an innate ability to tell tales of urban life, which has awarded them an avid fan base encompassing over 130k followers on Instagram between their accounts, and also swept up 1500 followers on Spotify within the last week alone, proclaiming a whirlwind of excitement prior to the records official major release. Both Young Adz and Dirtbike LB individually possess uncharted amounts of energy and character and when these forces collide it not only makes for something unique but also erupts in to an abundance of vibes, seen firsthand when D-Block Europe opened for Krept and Konan at Kentish Town Forum. Their live performance and stage presence now proceeds them and they have also been snapped up to perform at the BBC Radio 1 DJ, Charlie Sloth’s show at Electric Brixton as well as being confirmed for major summer festivals throughout 2018 including Strawberries & Cream and Reading & Leeds.